I forgot that I promised to share this recipe and so I'll do it now. My long time friends had been telling me about it for several years but I hadn't tried it until late last month when they brought it to our Gathering here at the house. You could let people just dip up what they wanted into a small bowl or you could do like we did and set it some where with toothpicks handy. It became a conversation snack place where a bunch of us stood around and stabbed the delicious contents with our small wooden weapons. No matter how you serve it, if you like shrimp and pickled veggies, you'll like this crowd pleaser. 1. Cook 5 # shrimp just until no longer translucent (Don’t cook too long). Drain and sprinkle with lemon juice. Cool. 2. Mix 4 tbs. vinegar with 2 tbs. sugar. Add to shrimp. Now here's where I differ with Mz. Hill - - - I would drain the juice from the jalapenos and onions but that's just me. We kept some leftovers which I ate on for several days and the pickling liquid got a little strong towards the end. However, I did not notice it at the Gathering that day. 5. Add 1 large bay leaf, 1 tall jar of black olives, 1 jar green olives (stuffed), 1 large can Del Monte carrots and 1 small can Del Monte carrots (only Del Monte will do according to Mz J. L. Hill) DRAIN CANS WELL BEFORE ADDING THESE TO REMAINING INGREDIENTS. You may wish to add small crab claws for extra seafood. Marinate in Frig at least 24 hours – stir several times during the 24 hours. Keep well chilled until serving and refrigerate leftovers. Oh MY GOLLY that looks delicious Thanks for sharing. 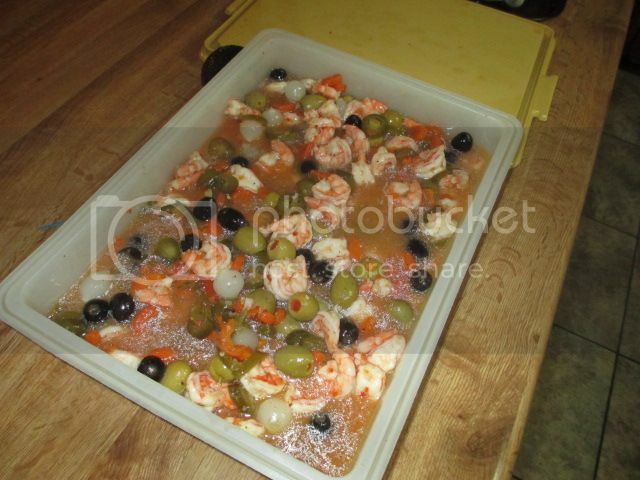 Could I use pre-cooked shrimp? yes indeed, especially if you know of a brand that isn't mushy - - - - our local HEB handles some pretty fresh seafood, even the precooked and I've used it in Gumbo and Etouffee also. If you do please let us know how you like it.